I have been looking forward to heading to the beach this weekend for approximately two months. The thought of diving under waves at blissful Twilight beach has been getting me through hot days and nights in this dust bowl. So, of course, it’s only natural that a tropical low brought on by a bloody cyclone up north will bring delightfully heinous weather to the region this weekend. 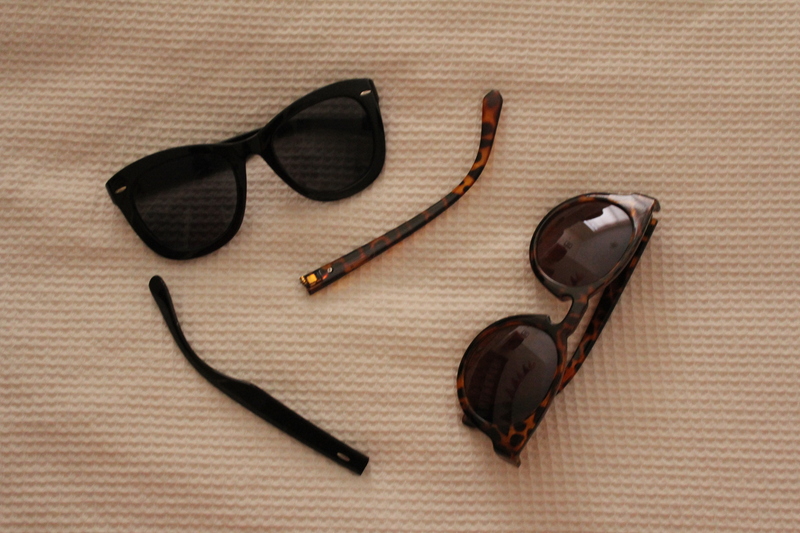 I have NEVER broken a pair of sunglasses in my life. Until last week when two pairs mysteriously broke apart in my hands. Even though they were both cheap/free (the tortoiseshell pair are from Diva and the black pair I found in my desk drawer at work?! Sorry Emma*…) I am annoyed because I really liked both pairs. Really I should have seen it as a sign: my sunglasses are topping themselves because they won’t be needed this weekend. Because there will be no sun. Positive side note: at least this will give us time to get really good at Men are from Mars, Women are from Venus the board game. Bec bought it from an op shop and we played it at a BBQ last weekend, with hilarious outcomes. How a self help book can be converted into a board game is anyone’s guess. This entry was posted in Misc and tagged Beach, Sunglasses, Weekend. Bookmark the permalink. Crossing my fingers you get a little sun. In Melbourne today and it actually feels like winter. How depressing! See you next time, Summer. I think the sunnies came from some kind of showbag or free giveaway with a magazine, something like that. I’d forgotten about the nail files, although I do still use my free emery board from Wendy Duncan. I’m quite fond of that. Hahaha when was Wendy giving away emery boards?! Jealous! There is a MAFMWAFV boardgame? MUST HAVE! Not going to lie, it’s awesome!